I love french toast. It’s one of those breakfast foods that never fails to put a smile on my face. What if you could recreate that delicious breakfast taste in a simple cupcake? These french toast cupcakes uses applesauce which gives them great taste and moisture. Preheat oven to 375ºF. Prepare cupcake pans with liners and set aside. Combine the butter and sugar on low speed until light and fluffy, scrape the sides as needed. Add the applesauce and the egg yolks and continue to mix. In a separate bowl, mix the gluten free flour, baking powder, salt, and cinnamon. In another bowl, whisk the maple syrup, vanilla, and rice milk. Add the flour and milk mixtures alternatively to the butter mixture, starting and ending with the flour. Raise the speed and continue to mix until fully combined. Cook for 15-17 minutes or until a toothpick comes out clean. While they are cooking, whisk the extra egg, 2 tablespoons of rice milk, and 1 teaspoon cinnamon. Once the cupcakes are done, quickly pull out of oven, and brush with the egg mixture. Place back in the oven on Broil for 1-2 minutes, or until the mixture has dried. Cool cupcakes in the pan for 2-3 minutes and then remove from cupcake pan and cool completely on wire rack for 10 minutes. Mix the butter and sugar until light and fluffy, scraping the sides as needed. Reduce speed on mixer, and add the milk and maple extract. Raise the speed to high and mix until fluffy. 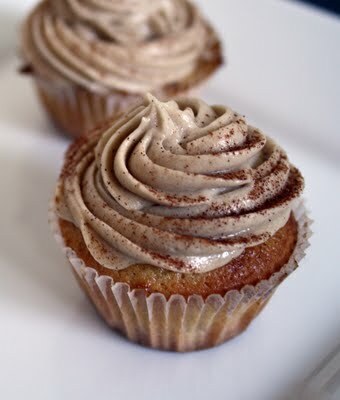 Coat cupcakes with frosting, then sprinkle with cinnamon.